The current weather Map/Charts of the sub-continent reflects a typical monsoon chart, with the monsoon trough running from Rajasthan thru U.P. and Jharkhand into the Bay, and an eastward extension of the trough running into the NE states. This is much better than having a " break monsoon" situation , where we see the trough running in a further north position along the Himalayas. And, this could very well have been the scene today with a weak MJO situation in force. With BB1 having embedded itself in the trough, the trough line has remained a bit to the southward position. Expecting the weak MJO phase to remain till July 1 st week. In vagaries, we had discussed this phase and anticipated its arrival after the fizzling away of BB1. But, in the current scenario, rainfall will be persistent along the axis, that is east Rajasthan, northern M.P, adjoining U.P. and Jharkhand. Good rainfall in the NE states. I observe the off shore trough to be more prominent south of Goa. Showers could be expected along coastal Karnataka, and to a lesser extent in south Konkan and Goa. What's in store for the next few days, the rest of June ? It may well happen, that with the BB1 remnants "raining out", the monsoon trough, or axis, could start moving to the north, and settle down into the Himalayan foothills. Then, the whole rainfall scene shifts north, more northwards than the areas mentioned above. This could well be the scene with no momentum and push from either of the seas. In such a situation, substantial increase in rainfall in Nepal and adjoining U.P. plains, and Utterakhand hills. Till the supressed MJO persists, it may not be possible for any of the seas on either side to bring up a system. The current SOI is +3, after maintaining an average of +18 in the last 5 months. BB2 is just a dream now, and could be a not reality before 4thJuly, at least. That is presuming the MJO phase to "give in" after that date. A ray of hope would be to expect a pulse, to move west from the current depression "Haima", now over North Vietnam. It could sail into the bay, and if it does, it could be as soon as by the 29th. Mumbai will to have this miserable hot humid weather thru the weekend. a short duration shower to two may give on the spot releif, only to get more stuffy once the sun is out. Meaningfull rains increament not in next 4 days at least. For those interested, Pics and videos of Mahableshwar trip on inter-actions page. Dangerous heat over Spain and Portugal, London and Paris eyeing hottest days in over 2 years...read more on Mark's Blog. Thanks you for sharing pictures of your trip. did you set up the rain gauage. Situation in North penisular and Deccan is very precarious. 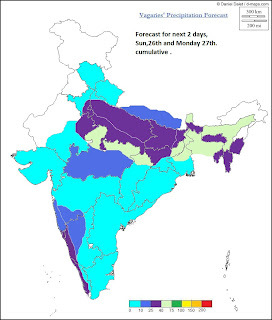 Do you agree with the Latest IMD forecast of below average rainfall, i susupect the situation could be far worse for western and southern regions . When the tropical depression 'Haimi' will enter into the bay of bengal this system instead of strenghthening will get weaken and will dissipate because of weak MJO am I right Rajesh? @ananth.North Madhya Mah, and Gujarat interiors is in bad shape. Anand dist in Guj. is 100% deficient ! Shall analyse and put up vagaries July estimate by month end. @shitij. If Haimi enters, it will be a weak pulse. IF..thats also to be seen. respectively." 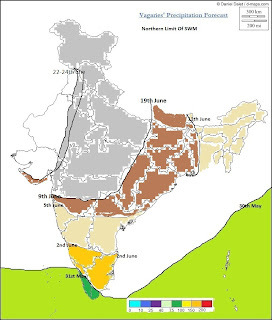 This one is least confusing, they are predicting the chance of deficient monsoon is 19%, for below normal is 37% and so on.... add 37% for below normal and 37 % for normal rainfall you get 74%. Does it mean that there is a 74% chance that the rainfall will be 90-104% of LPA ? Its a pretty big range I think... And the probability for either deficient or excessive rainfall is 26%..
excess rainfall." This point contradicts with point no. 1. Ratnagiri District has got bountiful rains from June most of the places have crossed 1000 mm within 25 days. I will put a updated list for week ending 26th by night or morning. Its really very confusing..in fact, I did not really pay much attention or go into details here..yes. The range is big, 90% - 104% with _+ 5%, i think..so see the ultimate range..its something like _"yes and No". Pradeep. So Agumbe is king now ! Pradeep, whats with the original champ? C'Punji ?? Why is it lagging at 1041 mms ? Deficit by 1356 mms !! Central India (MP, east Rajisthan) is again under dense clouds. Looks like BB1 is intensifying again????? Also places like Guana had received 39cmm approx 400mm of rain in 24 hours!!!! exceeding coastal rains this year. Also seems bay is feeding moisture to this central dense LOW. sset. No question of BB1 reawakening. Its the UAC in the axis.Expected in the "green" shading of yesterday's forecast in Vagaries.